I madly love all homemade gifts (truly, bar none), but this one happened to come at a moment in my life when my heart needed a little butterfly flutter. 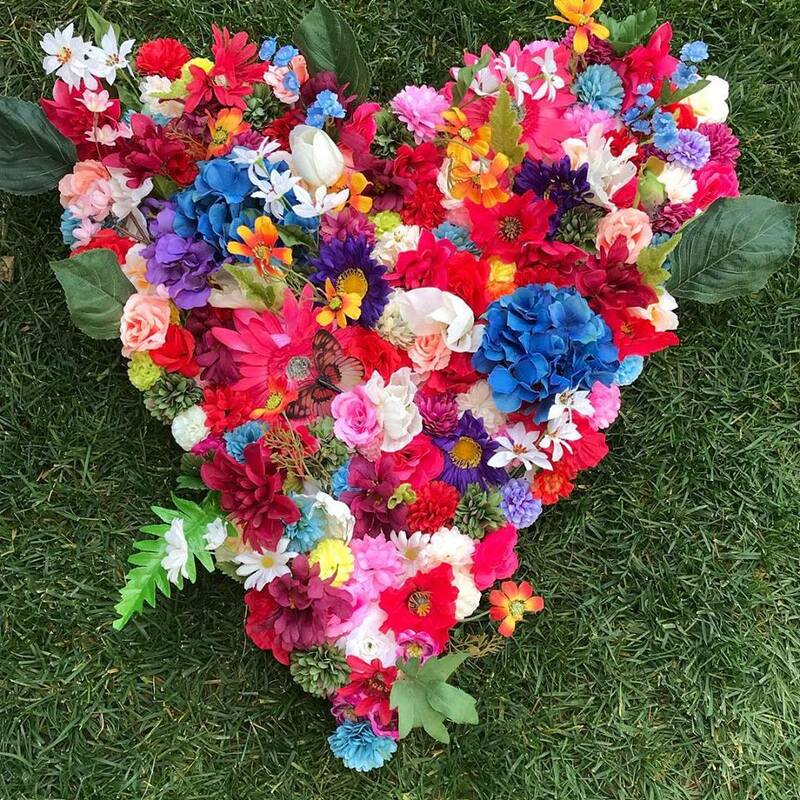 Today, I made this flower heart for my friend who particularly loves flowers and butterflies. I loved making it because I thought of her with every single flower choice and snip, and I got to tuck a butterfly in as a little surprise. As I was choosing and adding that butterfly, I was sent back to my childhood to a time that I was given one of the most precious handmade gifts I’ve ever received. That gift made this small effort pale greatly in comparison, but the remembrance sent me down a lovely butterfly memory lane that began when I was twelve years old. For as long as I can remember I’ve loved butterflies, but in middle school and high school I became a little obsessed. When I was in 8th grade, the most wonderful thing happened: I was invited to the beach house of my best friend Beanie’s grandma. It was situated right on the ocean with crashing waves just beyond the manicured yard which was largely filled with burgeoning lavender plants. And while those flowers did their best to beckon the beach getaway monarch butterflies, the piece de resistance for me at this elegant oceanfront oasis was the butterfly kingdom inside the house. Every room was filled with butterflies (except one room dedicated, much to my disappointment, to ladybugs) of all kinds. There were butterflies in every imaginable form and material: painted, sculpted, porcelain, wicker, silk, metal. Every glass, cup and plate had butterflies on it. Even the tiny bathroom off the kitchen was wallpapered with a hip 70’s geometric pattern that made you look twice: tiny silver butterflies! I have remained close to the group of girlfriends who used to go to the butterfly beach house during our childhood. In fact we have gone every year for a “chick weekend” reunion to that very beach house for over fifteen years. The house is about to be sold, which may be why even more butterfly memories are being awakened in me today. Two of the girlfriends from this “chick” group were part of creating what ended up being one of my favorite gifts of all time. It was sophomore year of high school, and my friend Maria was at the helm with my crafty and super sweet boyfriend, Shaun, at her creative side, with additional help from one or two other girlfriends. Together they had secretly made me an exquisite handmade butterfly quilt. There was such loving attention paid to every detail. They had searched high and low for beautiful butterfly and flower patterned materials, and hand-stitched each and every square together with love. My favorite colors at the time were green and purple so the backing was my favorite green, dotted with purple yarn accents. I remember finding out that they had been up all night before they gave it to me. I saw the blood, sweat and tears in that gorgeous quilt. I saw their sleepless nights, their multiple trips to fabric stores. I saw the effort to keep it secret from me. And, of course, I saw their love. I remember being overwhelmed by that love, and the feeling of never being able to express the proper amount of gratitude. I felt like I didn’t deserve such a beautiful gift. I was struggling to love myself at that tender age, so it was a lot to take in. There was a tsunami of love that was released as that quilt was unfolded in all its glory. This was the first group of friends who did their darndest to have me feel loved and lovable. That quilt became a representation of the possibilities of love. I took it with me everywhere. It moved wherever I moved. It’s in a box now, too delicate to even photograph because it has loved and been loved into retirement. But I can show you this accent pillow that came with the quilt. Yes, there was even more love! 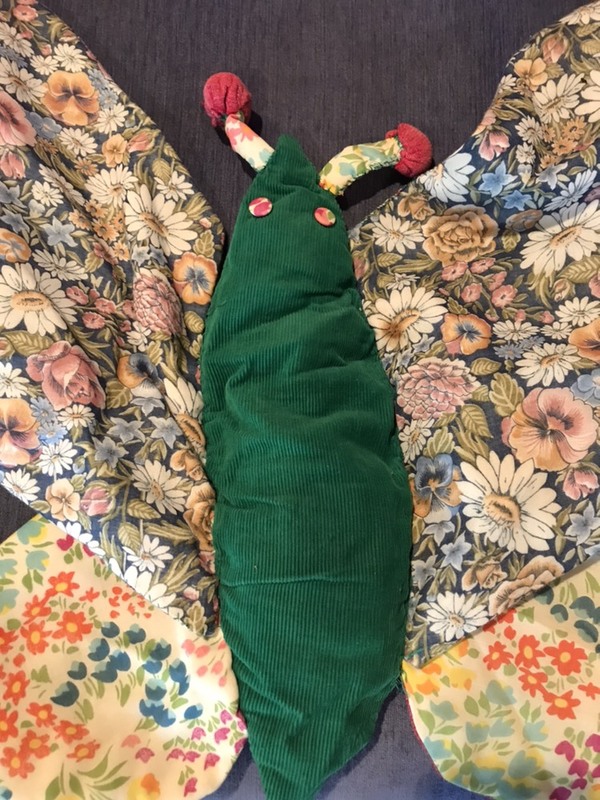 Maria had worked with scraps to make me a butterfly pillow. Look at those antennae + those eyes! I’m pretty sure I remember her saying she had whipped it up right before they presented me with the quilt. I madly love all homemade gifts (truly, bar none), but this one happened to come at a moment in my life when my heart needed a little butterfly flutter. I remain forever grateful to these friends for their love. I am blessed to have them still in my life reminding me of all the possibilities of love in this giant chaotic world of ours.